This American tank design inspired BT-5 Soviet WW2 fast Tanks can be found at the Tank Museum, Kubinka near Moscow, Russia. The letters BT stand for 'Bystrochodnij Tankov' which translated means 'fast tank'. The terms light and medium tanks were not yet being used. 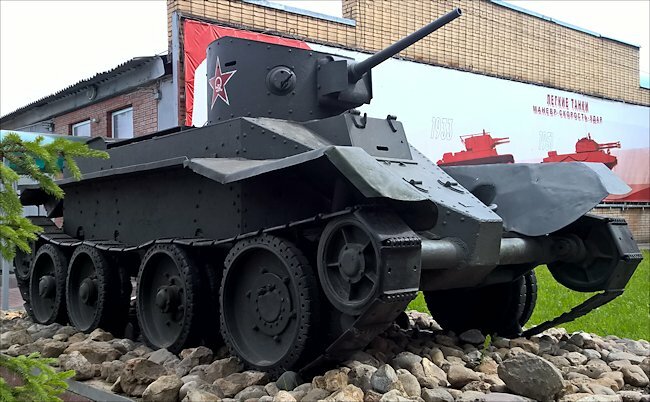 Soviet WW2 BT-5 tank with sloping armour and Christie suspension road wheels. The BT5 weighed 11.5 tonnes and was powered by a Khpz Model M-5 400 bhp modified aircraft engine that gave the tank a top road speed of 72 km/h (44.7 mph) when it was driven with its tracks removed. The American Christie suspension system was revolutionary. The tank tracks could be removed by the tank crew in 30 minutes and attached to the top of the track guard. This enabled the BT-5 tank battalions to get to front line under their own power fast. They did not have to rely on lorry or train transportation. If you look at the front of the tank in the picture, the first road wheel (not the one at the front in mid-air) does not have spokes, it is solid metal. The tank body behind it is indented. The driver, by engaging a lever, could steer the tank with this wheel. You can just about see the steering arm behind the wheel. 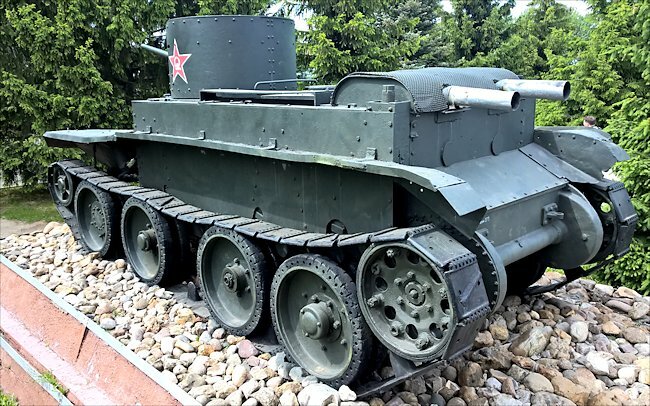 The BT-5 Soviet fast tank was in service from 1932 until the end of World War Two. Just under 1,900 were built between 1932 and 1941 at the Malyshev Factory. It was armed with a 45 mm Model 32 tank gun which when it was first introduced into service in 1932 was ahead of its time. It also had a coaxial 7.62 mm DT machine gun. It was a superior weapon on the battlefields of the Spanish Civil War and on the Soviet-Japanese border when most other tanks were armed with only machine guns or 20 mm main guns. Seven years after its introduction the BT-5 was starting to come up against anti-tank weapons that could knock it out with ease. BT tanks took part in the 1939 invasion of Eastern Poland and the Winter War in Finland. This was the tank that was sent to the front line to try and stop the German invasion of Russia in 1941 under Operation Barbarossa. It had to engage in combat with German Panzer III and IV tanks. Many historians have mocked the BT-5, BT-7 and T-26 as obsolete junk, in fact they were certainly superior to their most numerous German counterparts, the German Pzkpfw I and Pzkpfw II in most respects, and their guns were certainly effective even against the Pzkpfw III. 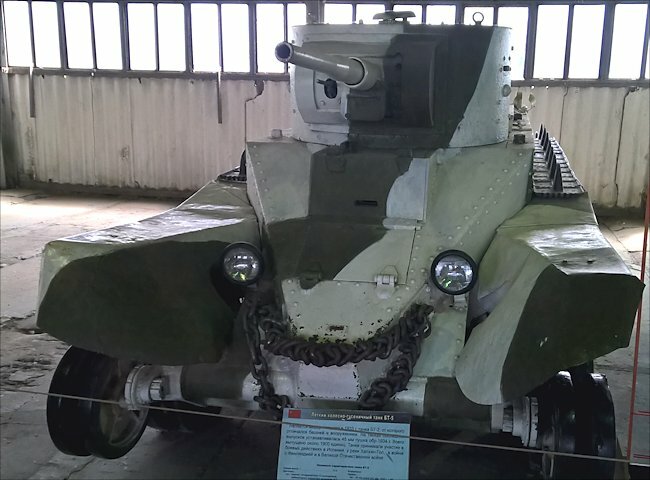 Soviet WW2 BT-5 tank with BT-2 turret at the Kubinka Tank Museum in Russia. You will see some BT-5 tanks with what looks like a circular horseshoe hand rail running around the outside of the tank's turret. This is in fact a radio aerial. These were fitted to command tanks only. Unit commanders could only communicate with other tanks in his group by shouting at them or using signal flags as they were not fitted with radios. The German tank crews soon started to look for these command tanks and try to knock them out first. The armour on the early BT-5 ranged from 6 to 13mm. This was extremely thin and could only protect the crew from small arms fire. They were also vulnerable to Molotov cocktails being thrown onto the rear engine hatches which the Finnish infantry soon exploited during the Winter War of 1939. Burning petrol would seep into the engine through gaps and joints in the armour and engine vents. The tank would very quickly catch fire. Soviet WW2 BT-5 tank with tracks fitted to its Christie suspension. BT-5 - larger cylindrical turret, 45mm 20-K gun, coaxial DT machine gun. BT-5PKh - snorkelling variant (prototypes only). BT-5A - artillery support version with 76.2mm howitzer (few made). RBT-5 - rocket launcher artillery version, equipped with two 420mm tank torpedoes (prototypes only). BT-5 flamethrower tank - (prototypes only). PT-1A - amphibious variant with new hull (few made). 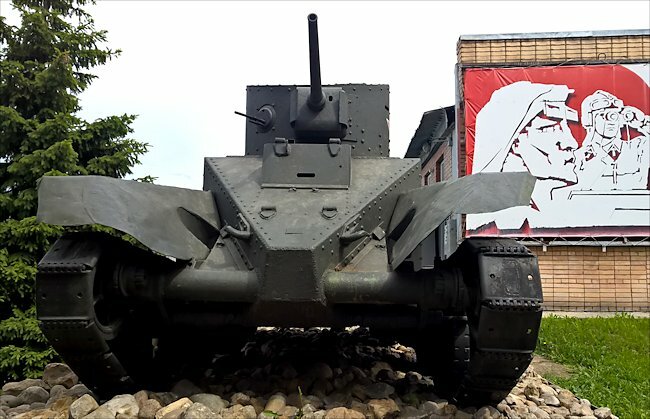 BT-5 tank with sloping armour front view. A big problem with the deployment of Soviet armour against the German invasion of 1941 was the relative inexperience and lack of training of some of their tank crews due to Stalin's purges of the of the experienced officer and senior NCO ranks. Another reason for the high amount of tank losses in 1941 were not from enemy action but in the Soviet Army's ability to repair broken down tanks. 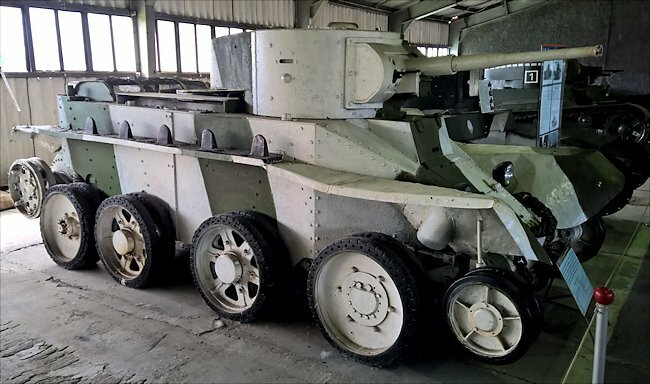 Russian Factories were prioritised producing large numbers of tanks and failed to make spare parts and get them shipped to the front line. When the tanks suffered a mechanical failure they had to be abandoned on the battlefield and destroyed by the tank crew so they did not fall into the hands of the enemy. Rear of the BT-5 tank at the Tank Museum, Kubinka, Russia. 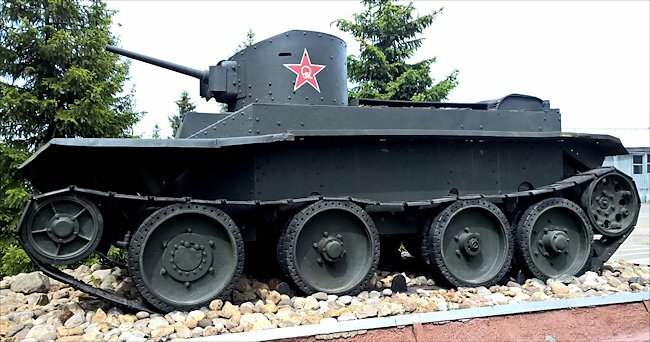 Where can I find other preserved BT-5 Tanks?